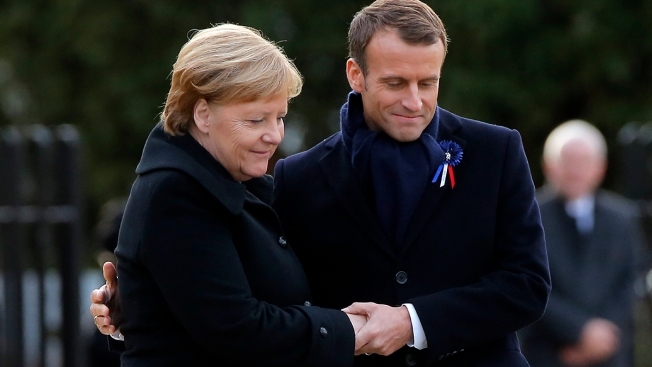 French President Emmanuel Macron, right, holds the hands of German Chancellor Angela Merkel during a ceremony in Compiegne, north of Paris, Saturday, Nov. 10, 2018. The leaders of France and Germany have held an intimate commemoration at the site north of Paris where the vanquished Germans and victorious but exhausted Allies put an end to World War 1. Traveling from across the world to monuments honoring soldiers who fell 100 years ago, victors and vanquished alike marked those sacrifices Saturday ahead of Armistice Day and assessed alliances that have been redrawn dramatically since the dark days of World War I.